The Bay of Plenty is true to its name. Whether its playing golf at one of several popular course, boutique shopping in one of the regions towns, relaxing on a golden sand beach or taking part in one of the myriad of activities, there is plenty on offer for visitors. Tauranga and Mount Maunganui are the gatekeepers to the Bay of Plenty and these days, as it grows Papamoa can be included with them. As one of the sunniest regions in New Zealand this is a popular destination no matter what part of the country you are traveling from. So much so that even Aucklanders have been known to take a day trip to enjoy all that is on offer. 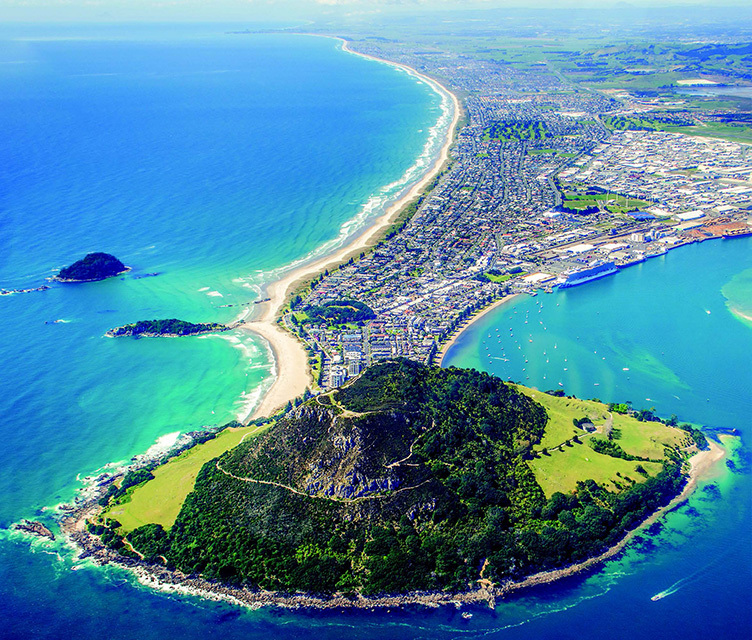 Mount Maunganui’s, or The Mount as many people refer to it, main beach is the ultimate spot to swim, surf and sunbathe and this glorious approximately 1km stretch of golden sand has been voted the best beach in the country. Mauao, Mt Maunganui’s iconic mountain defines the end of the beach and peninsula and Moturiki (Leisure) Island the other end. The Mt Maunganui Summit walk is about a 45 min walk uphill, it is described as a hard walk but is well worth the effort for fantastic panoramic views of the beach, inner harbour and port, Matakana Island and the comings and goings of ships to the Port of Tauranga. For those who think summit is too much for them the easier base track is an enjoyable walk. For a change from the beach you can while away your time at the salt water hot pools at the base of Mt Maunganui. For a bit of culture visit the Tauranga Art Gallery with its ever changing exhibitions. Or if you like being outside the Te Puna Quarry Park is a must see. This disused quarry has been transformed into a spectacular garden full of sculptures and native and exotic plants. For a bit of history take a walk through the cobbled streets of the Historic Village or visit The Elms. The Elms|Te Papa Tauranga is one of New Zealand’s oldest heritage sites with heritage buildings and nationally significant collections. This fast growing area has 16km of white sandy beach. There are numerous access points to the wide family friendly beach where there’s plenty of room to spread out or have a game of beach volleyball or cricket. Dig for pipis along the shoreline – eaten straight from the shell or taken home and tossed onto an open fire or barbecue until the shells open, or turned into pipi fritters they are a delicious treat. There are a dozen different course to choose from around the sunny Bay of Plenty where visitors are welcome. If you don’t want to travel from Tauranga or Mt Maunganui there are four courses to try out. Located at Tauranga Racecourse Reserve it is only 10 mins from Tauranga CBD. This 18 hole championship course hosts a Charles Tour event each year. This enjoyable course has holes to challenge all players. Just a few minutes from the busy Mount town centre, the surf beach and Tauranga Airport, with an 18-hole, championship layout golf course, with its picturesque surroundings in a sub-tropical climate, it provides a wonderful golfing experience for golfers of all levels, all year round. Close to Mt Maunganui’s Bayfair Shopping Mall this is a well maintained 18 hole course. This parklike course is gently rolling and has a reputation of being friendly and relaxed. A 15 minute drive out of Tauranga takes you to this popular seaside links course on the Omokoroa Peninsula. As with all the courses in the region it is well maintained and runs alongside the Tauranga Harbour. If you’re visiting from out of town, pick-up an Avis rental car from any of the following convenient locations, and earn Airpoints rewards with every booking. Plus, join Avis Preferred today and eliminate the paperwork and save time when picking up and dropping off your vehicle.